There’s no denying that college can be a bit difficult sometimes. Between the work load, living in a dorm room, and trying to balance extracurricular activities, it’s easy to get overwhelmed. As someone who’s been there before, here’s a list of 10 things every college student should invest in to make their experience 10 times better! Please note: CollegeXpress is not affiliated in any ol’ way with these products, vendors, companies, you name it! Our writer just found the best items and gadgets out there, and we want to share them with you! One of the worst things about living in a dorm room is the limited amount of outlets. No matter where you place your bed, the outlet usually is just far enough away that your four-foot phone charger can’t quite reach your bed. An extra-long charging cord is a necessity for every college student. Whether you just want to lie in bed while charging your phone or if you’re stuck a few feet away from an outlet in the library, a 10-foot cable will come in handy! On the topic of phone chargers, a portable charger is really a lifesaver. Every college student knows the struggle of having back-to-back classes in the morning, followed by club meetings or events afterwards. With a busy day, your cell phone is sure to run out of battery before you can make it back to your dorm room to charge it. Keeping a portable charger with you will make your life much easier. No more stressing about your battery being on 10% with 20 minutes left of class and an hour-long meeting after that. Your portable charger will become one of your best friends. I’ll be the first to admit that the Freshman 15 is very real. I got a FitBit during the beginning of my spring semester of senior year, and it helped motivate me so much. It keeps track of your total steps and miles walked (which is always high on a college campus), calories burned, heart rate, sleep habits, and stairs climbed, among other features. You can also challenge your friends who also have FitBits to walking challenges, which is a great way to convince yourself to walk more. One of my favorite features of the FitBit is was being able to get text notifications so I could read them in class if I wasn’t allowed to have my phone out. I have the Charge 2, but FitBit has a few different models for different prices! College is noisy. Whether you’re trying to watch Netflix while your roommates have guests over or if you’re studying in the library, which can actually get pretty noisy sometimes, noise-cancelling headphones are a great investment. These headphones are also wireless, which is great for intense gym sessions, so you can avoid pulling the cord out while going hard on the elliptical. I can’t tell you how often I used my Bluetooth speaker while I was in college. Bluetooth speakers are handy for so many reasons. We used them really often in my dorm room when we had people over. I was also in every club I could join, and the speakers were a hit at events, whether it was a community service event or just a mixer. I got my money’s worth from them, and I continue to use them even in my post-grad life. If you want to save a lot of money, buy a Keurig. If you’re anything like my roommate, who drank about five cups of coffee a day, you’ll thank yourself for having a Keurig in your dorm room. While a cup of coffee only probably costs about $3, it adds up quickly, especially if you’re drinking multiple cups a day. Besides, making your coffee in your room saves you time before your morning classes, and it gives you an excuse to buy lots of cute coffee mugs. Movie nights happen frequently in college. Instead of trying to watch a movie on a small laptop screen, hook your laptop up to your television using an HDMI cable. This is also great for lying in your bed and watching Netflix if you don’t want to have your laptop squished in your extra-long twin bed with you. Disclaimer: HDMI cables do not hook directly into MacBooks. You can buy an adapter to hook the HDMI cable into that and then into your TV! Aside from all of the fun things that college has to offer, there is also a lot of schoolwork that comes with it, which includes a lot of papers and PowerPoint projects. Most of your work will be done on your computer, and you’ll need to save a lot of documents, whether it’s classwork, homework, or just notes and presentations from your professors. I’ve heard far too many horror stories of friends breaking their laptops and losing all of their documents. Having an external hard drive is a necessity. You can back up all of your important documents, and if you somehow lose your laptop or break it and can’t access your files, they’ll all be there! Living in a dorm is tough because you sometimes don’t get air conditioning, and in most dorms you’re not allowed to bring an air conditioner with you. A fan will be a lifesaver on those hot days. On the flip side, dorm rooms can get really cold in the winter. Having a fan heater is beneficial year round. During the hot weather, you can use it as a regular fan to cool down your room. During the cold weather, you can change the settings to turn it into a heater to keep warm. It’s the best of both worlds! Lugging your laptop along with all your textbooks around campus can be a literal pain, especially if you have multiple classes a day with little time to go back to your room. A tablet can do almost everything your laptop can, but it weighs much less and takes up less space. I personally prefer an iPad, but there are many different tablets that you can purchase. Additionally, you can buy a keyboard to connect to your tablet to take notes easier. You back will thank you for carrying a tablet over a laptop! Pro tip: all of these items can be purchased through Amazon Prime, which is an absolute MUST in college! Sign up for Amazon Prime Student, and you get your first six months for free. Plus, you get Amazon Prime for a discount after the free trial is up! 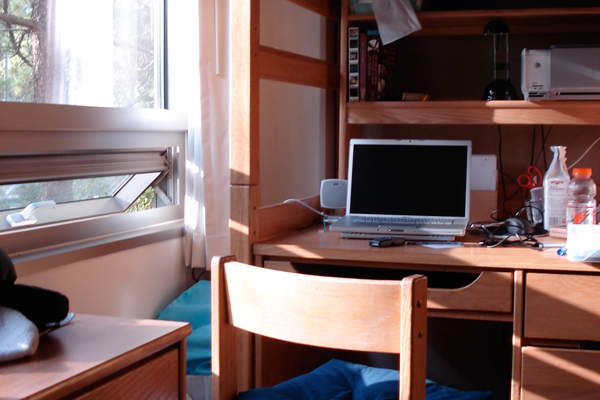 What helpful items do you need at college? Tell us on Twitter @CollegeXpress! Caitlin Duncan is a freelance writer from Enfield, Connecticut.